The name of the ancient division Nuvarakalaviya signifies the importance of its magnificent irrigation system and is derived from a combination of the names of three great reservoirs Nuwara Wewa, Kala Wewa and Padaviya. Of the three, the twin tanks: Kala-Balalu Wewa constructed by erecting a dam across the ancient Gonanadi played the most important role in agricultural development in the Nuvarakalaviya region. Today this large reservoir receives water from Dambulu Oya and Mirisgoni Oya, the flow of which has been augmented by Mahaveli waters coming via Bovatenna. The Dambulu Oya and the Mirisgoni Oya unite shortly before entering the reservoir. The Kala-Balalu Wewa also receives water of Hawan Ella Oya and copious drainage of the North-Western slopes of the Matale hills. The drainage which issues from the spill of the Kala Wewa flows from the spill-point onwards under the name of Kala Oya. According to the Mahavamsa King Dhatusena (455-473) constructed the Kala Wewa by amalgamating two reservoirs in existence earlier. The bund of this famous Kala-Balu Wewa is three and three quarter miles long and the height is 40 feet. It covered an area of 6,380 acres and irrigated approximately 7,000 acres of paddy fields. The 54 miles long Jaya Ganga also known as Yoda Ala which conveyed water from the Kala Wewa to the Tissa Wewa at Anuradhapura is also considered to be a work of King Dhatusena. The Jaya Ganga is forty feet wide and has a gradient of only six inches per mile for the 17 miles of its course. Understanding the locational heights at Kala Wewa, Tissa Wewa and the region in between and obtaining a low gradient in the canal system is clear testimony to the exceptionally precise and accurate contour leveling of the ancient irrigation engineers. The Jaya Ganga has pursued a steady but sluggish flow, disciplined by a bund which meanders in easy curves. In each of the subsidiary valleys on it's course water is diverted by channels into little village tanks or chains of tanks. The tanks lower down receive the overflow from the tanks placed higher in each chain. The scheme was so perfect that the ancient canal afforded irrigation facilities to approximately 180 square miles of land to the East of the Kala Oya between Kala Wewa and Anuradhapura. It is said in the Mahavamsa that Migara, commander in chief instigated Dhatusena's son Kashyapa, to imprison the former and take over the kingdom. Later Kashyapa was further incited to ask for the place where he had hidden his treasures. Dhatusena took Kashyapa's messengers to Kala Wewa and showed them the tank and told them "My friends! This is my whole wealth." After Dhatusena's time the Kala Wewa was restored or improved by several subsequent monarchs such as Parakramabahu I (1153-1186) but with the collapse of the Rajarata civilization in the middle of the 13th century the reservoir was neglected and fell in to oblivion. In the subsequent centuries, there occurred several breaches in the bund. Kala Wewa was a strategic location in between upcountry and plains of Anuradhapura. It was the location of a pitched battle between Jetthatissa and Aggabodhi III in 628 A. D. King Jetthatissa having lost the battle committed suicide in the battlefield. In the middle of the 13th century a battalion of Kalinga Magha's retreating forces was encountered at Kala Wewa by the Sinhalese forces. In his escape journey from the Kandyan territories, Robert Knox passed through Eppavala Korale and Kaluvila in 1679 and found that the region had only few settlements. With the interests in understanding and restoring ancient irrigation works by the British government, the first inspection of the Kala-Balalu tank was made by Major Forbes and George Turner in 1832. They found the double sluice in the reservoir in a perfect state of preservation and a spill made by a great mass of solid masonry. The well preserved Bisokotuwa was faced with enormous plain slabs running its whole length and backed with brickwork. The restoration of the Kala-Balalu Wewa started in mid 1880s and was completed in 1887. The restoration was effected by diverting the bund past the main breach and by the construction of a fine masonry spill 560 feet in length. The restored tank is slightly at a higher elevation when compared with the original reservoir. A monument was erected to mark the restoration at a spot between Kala Wewa and the Balalu Wewa. The writing on the monument states: "Kala Wewa deserted and in ruin for many centuries was restored to same measure of its former utility in A.D 1887 in the 50th year of Victoria, Queen Empress, Arthur Hamilton Gordon being the Governor of Ceylon". The same inscription is repeated in the Southern face of the monument in Sinhalese. The Western side is filled with a bust of the governor in bas relief. A bronze tablet on the left abutment bears the following inscription. "Kala Wewa restored in 1887, the Honourable Arthur Hamilton Gordon, G. C. M. G., Governor of Ceylon, Walsh Warrington, Engineer, Ratwatte Lokubanda, Ratemahathaya of Kalagampalata, gave assistance in procuring labour." Along with the Kala Wewa restoration, the Jaya Ganga was also restored between 1885 and 1888. After the restoration of the Kala Wewa and the Jaya Ganga the British government adopted a special colonization scheme at Kala Wewa and surroundings in 1890s. The government, concerned at the low rate of settlement under restored reservoir and canal system, sanctioned a scheme for aided colonization as a special measure. Two batches of Tamil colonists from Jaffna were brought into Kala Wewa giving substantial aid in the shape of free transport, maintenance for six months, ready built houses, free seeds and tools and facilities for hiring buffaloes and ploughs. It was hoped to recover at least some of the costs of this aid. An attempt was also made to settle on newly irrigated land, Sinhalese peasants from a local purana village and a few low country Sinhalese. However, the scheme failed and there was much sickness on top of certain social problems. Some colonists returned to Jaffna, and the government tired of the scheme, decided to sell lands under Kala Wewa without resorting to colonization. 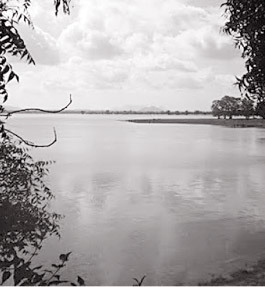 In the early 1930s further restorations were effected in Kala Wewa and its channel system. The re-restored complex enabled the establishment of more colonization schemes such as Senapura, Alutdambe, Watana, Aluviharegama and development of more agricultural land. The colonization was not altogether unsuccessful but there was trouble of a familiar order. Malaria caused much sickness, some deaths and many desertions. The phase I of the Mahaveli development programme which involved the construction of the Polgolla-Bowatenna irrigation structures in mid 1970s further increased the irrigation capacity of the Kala Wewa. Consequent growth of agriculture in the Kala Oya valley resulted in the development of small townships of Galnawa, Meegalawa, Tambuttegama, Nochchiyagama, Madatugama and Galkiriyagama coming under the Mahaveli system H.